Do you want to eat delicious Thai food in an authentic setting? Yes? Then visit OrangeGrass! This restaurant is definitely a hidden gem. My cousin (who brought this fantastic restaurant to my attention) asked me last week why my blog hadn’t feature OrangeGrass yet as it was definitely underrated. I knew that I had to do a review on it! I went to OrangeGrass with MrJ and my parent-in-laws for a birthday meal. We didn’t really know what to expect, as we had never had Thai food before and were just going off a recommendation, and the outside surroundings of the restaurant look pretty shady, but we had a great experience! For starters we got two OrangeGrass Mixed Starters (£14.50 for two people) that featured an array of samples of the starters on offer. 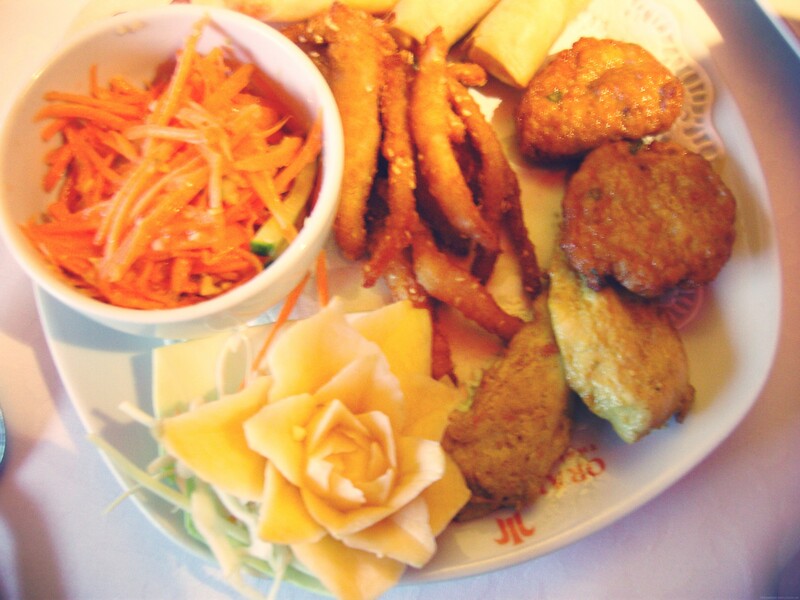 We thought this would be a good way of introducing us to a range of Thai food! It was amazing! The starter included: Som Tam, Gai Satay, Gai Geaw, Po Pia Tord, Tord Mun Pla and Gung Hom Pha (click here for descriptions)! The flavours and texture were delicious, the presentation was beautiful and after we had munched our way through everything we were even more excited for our main courses to arrive! When they came, we were not disappointed! Decent size portions that were cooked to perfection, and we started eating straight away so unfortunately there are no main course pictures for you delightful readers! (I’ll have to go again and be more snap-happy!) I had the Gai Pud Priew Warn which was stir-fried chicken with pineapple, lychees, tomatoes and peppers in a sweet and sour sauce! It was delicious! They have such a variety for their main courses including sea food, curries, thai salads and more! Prices range from about £7 a dish to £14.50 for some seafood dishes! Also, check out the menu as some seafood dishes need 48hrs notice so it can be bought and cooked especially for you! The rice and noodles that accompany your main dish are bought separately and range from £2.50-£2.75. I wish that oriental restaurants would just include these in the price of the main dish, as it just makes eating out that little more expensive! I would whole-heartedly recommend OrangeGrass for a delicious meal out. The service was fantastic and the staff were lovely and attentive. Everything you could ever want! And if you want to make your evening even more special – then visit on a Tuesday where they do live Thai carving demonstrations, which would be amazing to watch! OrangeGrass is located at 7 Mount Terrace, South Shields. Find them on twitter too!